The workshop was a first attempt to experiment with ways to challenge, resist and circumvent the interface design and functionalities of Facebook. 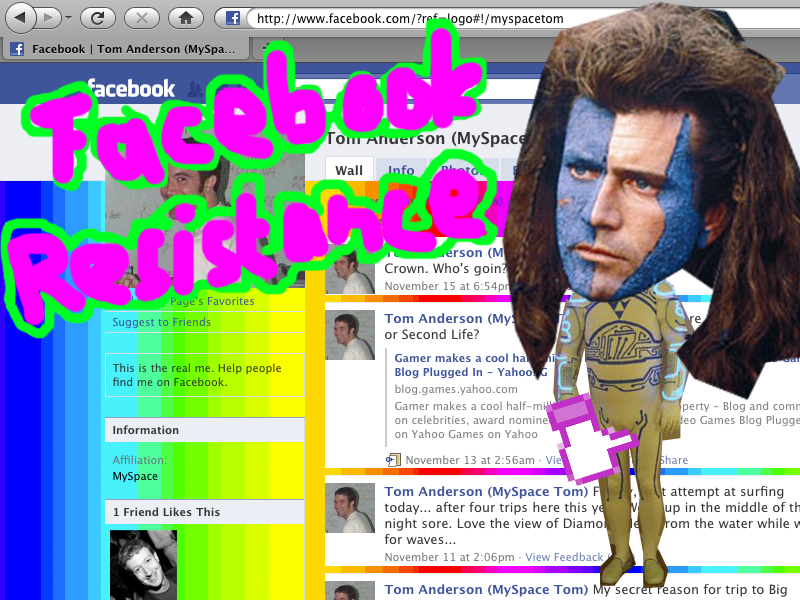 The purpose is not as Tobias stressed to resist Facebook altogether, but to find new creative ways in which we can challenge some of the parameters through which we are meant to behave on these sites. I agree. Exiting and quitting cannot be the only options. Quitting is easy, ”researching on ways to change its rules and functionality from inside the system” as it says in the workshop description is certainly not. Tobias has extensive experience with experimenting with code, browser apps and interface design. Some of the projects that he is best known for, Pirates of the Amazon and China Channel are both impressive software-based art interventions into the politics of the Web. The Amazon pirate browser add-on linked the BitTorrent search engine of the Piratebay.org to Amazon, so it would install a “download 4 free” button on Amazon.com, in principle letting you download Amazon stuff for free. The project was meant as a scholarly work on the Internet in the shape of a software hack in order to critically comment on current media distribution models. For the China Channel, Tobias made a Firefox plugin that reroutes your IP through China, allowing you to browse the Web as if you’d look at it from within China, allowing you to check the state of the censored Web yourself. There was a great interest in the Facebook resistance workshop, only confirming that people have been looking for this kind of stuff to happen. This time around, as it was the first workshop of its kind, the participants more or less threw out ideas on what kinds of interventions they would like to see happening. “I want an alert of people stalking me”, “I want to have more variety on buttons describing my emotional status”, and “I want to have a gender neutral button, and be able to have 4 wives!” Some even got around to actually code some stuff as one group did on personalized ads. Other interventions could be to design a dislike button (someone already did this), make custom background images and visual css styling for your visitors or simply change themes as in changing Facebook’s color to yellow…check out the below video for some visual and audio (!!) impressions from the workshop itself.